I enjoyed a very good night's sleep and by 8 am I was showered and dressed. James wasn't so quick out of the blocks this morning but we were still heading up to the bar for breakfast by 9.20. It was another superb morning and we had to decide what to do with our 'day off'. Breakfast consumed, we made the decision that now would be the time to do the one specific thing that we always want to do at Le Mans when there is no on-track action and the roads are open - a lap of the circuit. So having left the bar we drove into town and joined the circuit at Tertre Rouge. We motored on down the Mulsanne Straight and then along to Indianapolis and parked up on the outside of the cambered left-hander, but not before we had tested the kerbing/rumble strips on the outside of the corner which turned out to be one of those silly but rather memorable moments that I captured for posterity on video! We spent quite a while at Indianapolis, noting the very substantial camber to the corner which I confessed I've never really taken much note of before. We watched the lone occupant of a white Audi R8 (the road car, that is! ), drive back and forth through the corner at last a dozen times. I've little doubt that many others do the same. There is something undeniably special about one of the world's most famous racetracks being so accessible to the public. I talked in yesterday's chapter about how 'eerie' a car park can be but the track here also has that kind of quality to it. The traffic was very light and there were only a handful of other people stopped like us to take in the fact that in something like 30 hours time there would be sports prototypes and racing GT cars thundering in to where we were now standing while we, the paying punters, would be captured behind fencing in the spectator areas. These are the moments that you just don't get to experience unless you get to the circuit 'out of race' or practice. But if like me you have a fascination with what makes Le Mans such an evocative place, these are the things you need to take the chance to do, and I'm always very grateful for the fact that James and I are so very much on the same wavelength when it comes to things like this. After taking our fill of Indianapolis it was back to the car to continue our journey around the circuit. We followed the track around the right-hander into the beginning of the Porsche Curves and drive up as far as the barriers preventing cars from continuing on at that point. There was a car a little way behind us that must have thought we were on to a good thing as they followed us, only to have to turn around again like us. We completed our 'lap' and headed for Parking Blanc but the car park was closed, however we were able to park opposite the museum - I recall we were lucky and grabbed the last free space. We had hoped to be able to get into the pitlane however we were turned away by security but we were told that if we wanted to, we could get up into the back of the pits grandstand. With nothing else in mind we walked up and along the back of the stand looking down into the teams' working areas, including Rebellion where a team member was busy applying the blue mirrored films to items of bodywork. Having reached the end of that floor we walked on up the stairs to the top of T34 where we could look along the full length of the entirely empty grandstand while glancing across to T17 and T18 which were also devoid of life. All we could see were 4-5 people sunning themselves on the tribunes. We then noticed one or two cars being pushed up the pitlane so we walked up to the pit in end to investigate. There was some kind of photoshoot going on involving a number of P2 cars and one of the Clearwater Ferraris. We had no idea why. Some shots were taken and the cars were then pushed back to their garages. We must have spent about 40 minutes in the grandstand which afforded the distinct advantage of some very welcome shade. By the time we left T34 we were both thirsty and hungry so we stopped at the cafe in the back of the paddock which was made up to look like an American diner. We had our first jambon et fromage baguettes of the week and a cold Coke to slake our thirst. 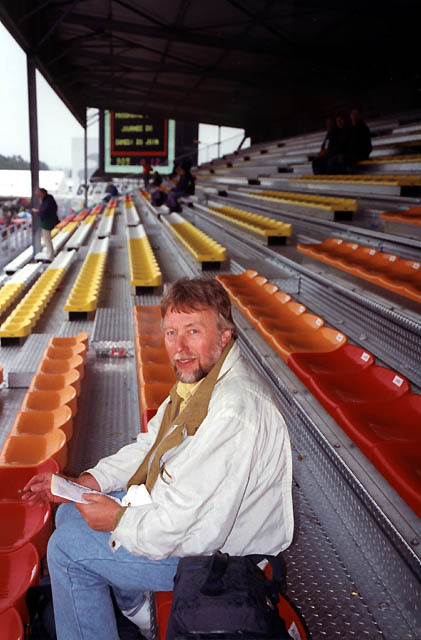 Now one of the major changes for us this year (actually it may have been the only major change) was, as I mentioned earlier in the story, our grandstand seats. We had of course missed out on our normal seats in T17 and ended up plumping instead for seats in Raccordement, the grandstand facing across the Ford Chicane. As we had nothing else 'on' we thought we would walk back to the outside of the track to check out the seats. James hadn't brought the tickets with him but was fairly confident of the seats and the row numbers. As we walked down in the blazing sunshine, James was clearly worried that our seats were towards the far end of the stand in the area that might attract the full force of the sun on race day, however when we got there and checked out the seats they were much closer to the middle of the stand so that between 2 pm and 7 pm when we were likely to be in them, we would be in the shade. In terms of location, near the middle was excellent but the disadvantage was that we were in row C, just three rows up, which was going to make it impossible to take photographs over the fencing. The other disadvantage was the small backless seats and the very limited space for each occupant, bearing in mind just how much we had been spoiled by our front row seats in T17. Still, a change was definitely as good as a rest and I was looking forward to seeing the start of the race from there. Having spent the best part of an hour checking out all of the potential views from the grandstand, including earmarking seats with the best photographic view in mind (should we explore coming back to this stand again in the future) it took me back a full 25 years to the only other time that I had a seat in this grandstand (when it was known as 'Maison Blanche') with my old friend Peter Dyment in 1992. There was no doubt that the stand afforded a great view of the cars, both as they appeared from the Porsche Curves and then as they accelerated again up the start/finish straight. So, curiosity satisfied, we left the stand and walked along the back with the vague notion of checking out the Porsche Carrera Cup support paddock which was situated at the outside of the final part of the Porsche Curves. It was as we walked past the entrance to their paddock that we realised there was nothing to stop us walking out onto the track so we went out for a look around. As it had been earlier in the day at Indianapolis, it was rather fun to stand in the middle of the track with the place all but deserted. We were able to get a close look at the kerbs and the rumble strips which were much more significant in size than you would appreciate when watching from the spectator areas. We walked down to have a look at the last part of the Porsche Curves until we realised that it was by now getting on for 3 pm and we had a decent walk back to the car. It was Tuesday of course and that meant one thing - Tony would be arriving in a couple of hours or so. We got back to the hotel around 3.45. For me, it was cold shower time - it had been a really hot day and we had spent a fair but of it out under the sun. It was good to have some time to chill as the next couple of days were going to be quite a bit busier. Tony arrived at about 5.20 pm and was able to bet straight into his room to sort out his stuff and have a shower. After that it was business as usual for the growing band of 'disciples' with dinner at Del Arte and a reasonably early night after that.